Aalu masala or urulakelangu poriyal is the perfect accompaniment for poori. I love poori with aalu. The same recipe of aalu masala can be used for dosa or to prepare masala dosa. This goes very well with chapatti too. 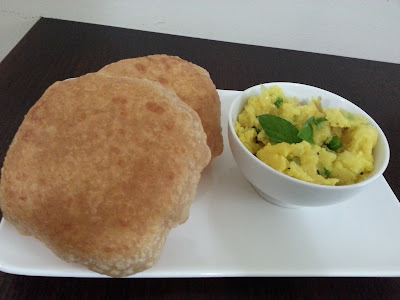 Coming to think of it poori and chapatti are the same except that one is deep fried and the other is pan roasted. 1. Pressure cook or boil the potato till completely cooked. Peel it and mash it well keeping a few small pieces if desired. Keep this aside. 2. In a cooking vessel heat oil. Add the mustard seeds and let them splutter. Add urad daal and cumin seeds if using and le them brown. Add curry leaves. 3. Immediately add the chopped onions and mix well. Fry till onion turns translucent. 4. Add ginger gwrlic paste and mix well. Fry for a minute. 5. Add turmeric powder and salt and give a stir. 6. Add the green peas if using and stir. 8. Add the coriander leaves and mix. Cook for a few minutes stirring well and you can serve it at this stage. 9. Add water and thin it down a bit and cook further to have a masala type consistency of choice. 10. Mix besan with water and make it into a paste. Add it to the potato in step 8 and continue to cook to a consistency of choice.